Project Connect lead Kyle Keahey, presenting his group's initial recommendations last month. The group’s worked since the summer to create an initial recommendation on urban rail. With any rail line serving the central business district downtown, Project Connect began gathering input on which “subcorridors” leading from Downtown should also be served by rail initially – before deciding on Highland and Riverside. But some say it’s been designed to obfuscate an obvious choice. A former member of Austin’s Transportation Commission, Dahmus has been a vocal critic of the Project Connect process. He says successful cities do one thing when it comes to creating a new transit line: run it from a dense residential area to a dense employment area. 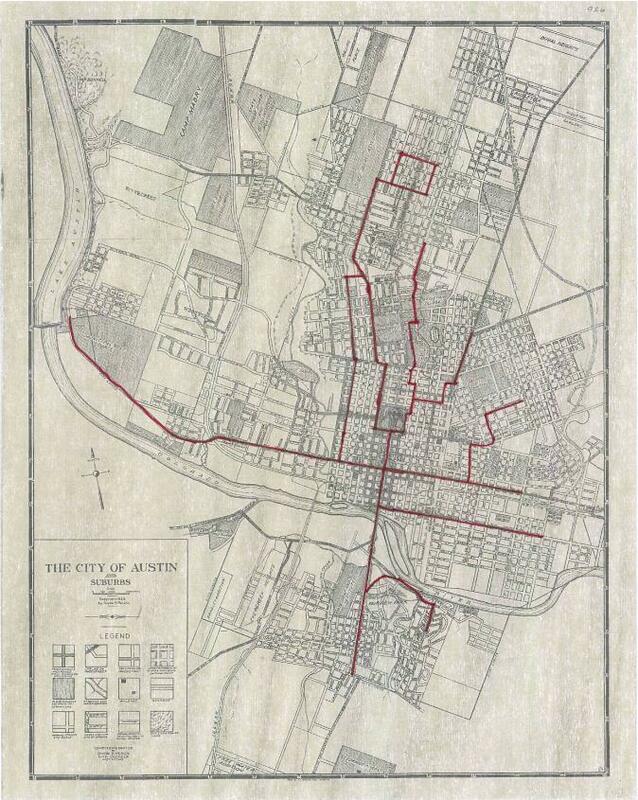 “There is one corridor like that in Austin,” he said: the Guadalupe/Lamar region, currently served by Cap Metro’s No. 1 bus. 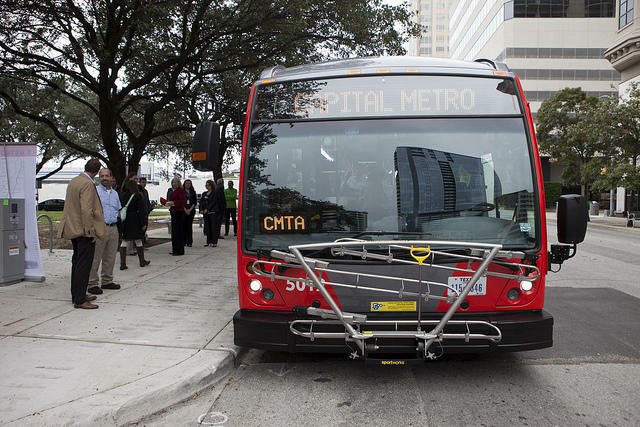 A bus in Capital Metro's new MetroRapid fleet. There’s also the issue of Cap Metro’s new MetroRapid service, launching in January, and the possibility it may have doomed rail’s chances on Guadalupe/Lamar. The rapid bus service is launching thanks to a $38 million federal grant. Move the line, some worry, and Cap Metro could lose the money. Announcing Project Connect’s recommendations, Kyle Keahey said MetroRapid played no role in the group’s decision. And while MetroRapid wasn’t a strike against Guadalupe/Lamar in Project Connect’s measures and indexes, it definitely was an issue when it came time to make a decision. The Central Corridor Advisory Group, led by Mayor Lee Leffingwell, OK’d the Highland-East Riverside proposal last week. Asked at that meeting what impact Guadalupe/Lamar rail would have on MetroRapid’s support from the Federal Transit Administration, Cap Metro Vice Chair John Langmore didn’t mince words. “Let me say unequivocally, absolutely 100 percent that all of our dealings with the FTA have indicated at we have to continue forward with the MetroRapid project as its been proposed, and as its ready to be launched in one month,” he said. Langmore continued that if MetroRapid’s an undisputed success on Guadalupe/Lamar, there’s no reason it can’t be served by rail at a later date. But transportation activists say expansion won’t be an option – if rail’s first phase isn’t a success.